Despite the predictability of the evening, The Oscars honored some pretty amazing talent this evening. One of the nicest surprises came when the glorious Midnight in Paris, which took home the best original screenplay award. 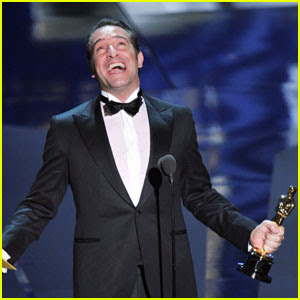 The Artist, the luscious silent film, garnered a slew of wins, including one for lead actor Jean Dujardin, who was so excited he reverted back to his native French at the conclusion of his acceptance speech. The film tied "Hugo," which swept most the technical awards, with five wins. The Artist director Michel Hazanavicius lovingly paid tribute to his gorgeous real-life leading lady Bérénice Bejo as he accepted his Oscar. In another semi-shocking win, screen veteran Meryl Streep snagged the Oscar from favorite (?) Viola Davis, ending her near two-decade losing streak. As reviewed on the site late last year, The Iron Lady is certainly a flawed movie that is propelled by its performances, including Streep's. This is Streep's third win of her career (she's previously won for 1980's Kramer vs Kramer and 1982's Sophie's Choice). You have to admit, her acceptance speech was touching, especially when she spoke of her husband and longtime professional peers. Speaking of screen veterans, Christopher Plummer won for his role as a dying gay father in the touching Beginners, and in his acceptance speech rightfully shouts out co-star Ewan McGregor, who was also great in the movie, and received the night's first standing ovation. Plummer becomes the oldest person to ever win an Oscar at the age of 82. Another win practically everyone expected is Octavia Spencer for The Help, who also brought the crowd to their feet as she tearfully accepted her award.....So there's that. I kind of loved streep's acceptance speech. I hated that Meryl won but at least she told the truth. So glad Hugo did not get best picture, I was afraid I was going to have to shoot my TV.